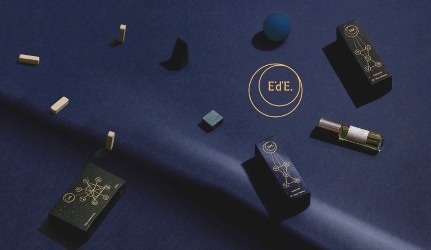 Indie line MCMC Fragrances has launched E.d'E. Black and E.d'E. Blue. The new fragrances are a collaboration with the design and branding agency FUZZCO. Subtle variations on a theme, this unisex perfume oil duo is inspired by the duality of light and dark depicted in Vermeer's still life paintings of fruit. E.d'E. Black ~ "bright yuzu citrus is hit with a spike of pink pepper, quickly fading to the dark undertones of strong Japanese cypress." E.d'E. Blue ~ "bright yuzu citrus is hit with a spike of pink pepper, enhanced by the unique nuances of richly hued Rosewood." Both fragrances also include a white musk note. MCMC E.d'E. Black and E.d'E. Blue are available in 10 ml Perfume Oil, $55 each.